Bathroom remodeling projects can be surprisingly fun for smaller spaces. It’s fun to dedicate resources to a bathroom project because it’s a space that your homeowner clients use multiple times a day, and guests often pay a visit to occasionally. Our team at ProSource® of Pinellas County enjoys working with trade professionals and your homeowner clients on bathroom remodeling projects because the possibilities are endless for the result. From design inspiration to the final product sale, trade pros can depend on ProSource as a business partner in bathroom remodeling projects. 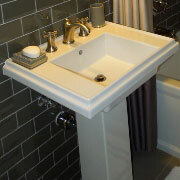 The bathroom sink is used frequently, so it absolutely needs to function well. From standalone pedestal sinks to beautiful bowls that incorporate nicely in vanities, bathroom sinks can establish the character of the room. The faucet is a lovely accessory to the sink, but it’s also an essential piece of equipment. 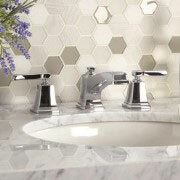 ProSource stocks sink faucets in nearly every color, material, and style to meet all design ideas. The shower is a get-away as much as it’s a useful place to get clean. Shower updates can include everything from new tile or stone to upgrades to faucets and handles, and more. We work to make sure you have the right products for the existing or new plumbing, dimensions, style, and other amenities. Vanities are a very cool piece of bathroom furniture because it is a piece that is capable of tying together the rest of the space and features. Like the shower, a tub is both functional and an oasis. 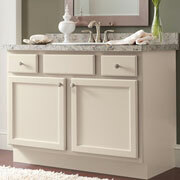 Bathroom remodel projects often include an updated tub, since they bear a lot of wear and tear over the years. 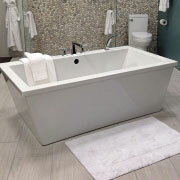 ProSource has the reliable and stylish tubs — from clawfoot standalone tubs to shower-tub combos — you and your clients expect. The throne. 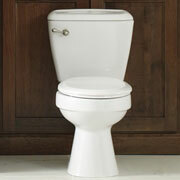 It’s a wonderful piece of the bathroom to upgrade because it’s used so often. ProSource can help trade pros and their clients pick out the right toilet based on flush ratings, bowl size, accessories, and more.